For purists like myself, Blood: The Last Vampire on anime is far superior than the live action movie, even though that was quite entertaining to watch, not just for your visual senses if you get my drift! Already released on DVD, Madman have re-released the animated story once again on Blu-ray which only amplifies the amazing animation and quality ever so more and needless to say, when the action begins, the blood starts to splatter and looks like a Quentin Tarantino movie gone wild. Apart from the quite interesting story, the fight sequences are like watching two vampires on Ritalin or some other psychedelic drug of choice. The protagonist of this film is Saya, a cute young girl who has a dark secret... she is actually a vampire (one of the last remaining) and forcibly works for the Japanese government. Unfortunately things have gone awry and the undead threaten the world of humans. Donning her deadly Samurai Sword and her killer outfits, Saya will risk her life in order to save the humans who are the key to her own salvation. So find a comfy chair, dig your hands into the armrest and sit back for one of the most entertaining anime rides of your life as Blood: the Last Vampire comes to your FULL HD TV. As mentioned, the animation is quite impressive on this release that uses both hand drawn animation and 3D computer graphics to meld this story quite nicely together. In terms of quality, blacks are deep, colours are vibrant and there was no artifacting whatsoever. 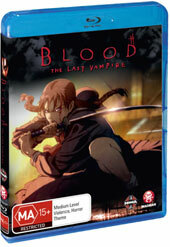 To compliment the video, Blood: the Last Vampire boasts DTS HD for exceptionally clear audio and during some of the battles, it sounds like their is a war in your lounge room, thanks to its careful use of surround sound. Unfortunately the special features are a little limited with an interesting making of the movie and that's about it! All in all, this is still a worthy release, just for the amazing story on Blu-ray!